It is with those hopes and dreams that many enter marriage. 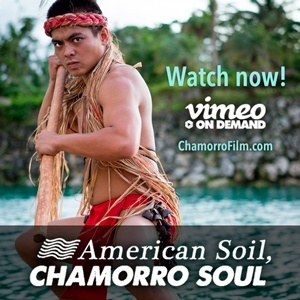 But before all that, The Most Important Day of Your Life on Guam must be carefully planned. What do people normally think of when they find that precious someone to share the rest of their lives with? Of course, they will promise one another happiness, possibly to start a family, work hard to purchase a home, or perhaps they wish for eternal romance, a honeymoon that never ends. It is with those hopes and dreams that many enter marriage. But before all that, The Most Important Day of Your Life must be carefully planned. While wedding celebrations are trending towards economy style,“the cost for the wedding is still quite high so people can’t easily divorce,” according to a journalist Sanae Otomo, general manager of World Bridal, heard on TV. World Bridal has three chapels on Guam — Nikko Hotel (Crystal), Marriott Resort (Amantes) and Pacific Islands Club (St. Laguna), averaging 18 couples a day. Otomo agreed with the journalist on the importance of budgeting enough money for The Big Day. 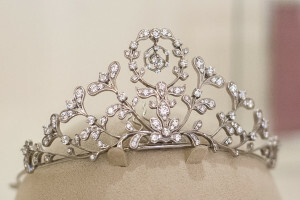 World Bridal appoints an individual coordinator to each client to manage all things bridal, from pick-up at the hotel to coordination at the salon to arrival at the chapel. “The wedding can be done even if you have disabilities. There’s no problem even if you cannot speak and/or hear,” Otomo stated. Her strong confidence and hospitality sent tingles down my spine during the interview. Most Guam residents may be aware of the huge volume of couples coming to Guam to get married from Japan, China and Korea. The short distance from their home not only makes it convenient, but they can bring their senior family members to celebrate together with ease. Some aged Japanese couples are even making the trek to Guam to seal their vows after the life-altering tsunami disaster. Some local couples even bring their believed pastor to seaside chapels in keeping with their religious traditions. 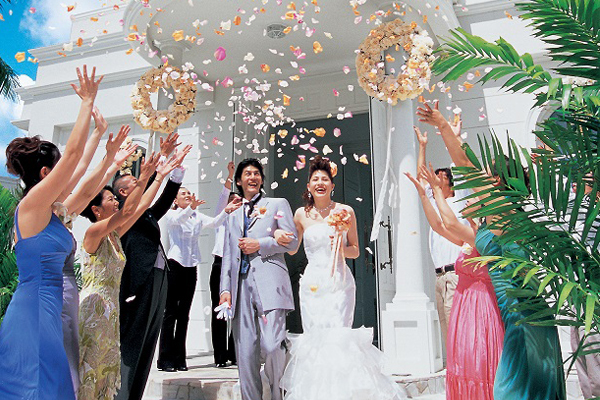 Whatever the preferences, Guam’s bridal boutiques and wedding planners can oblige. 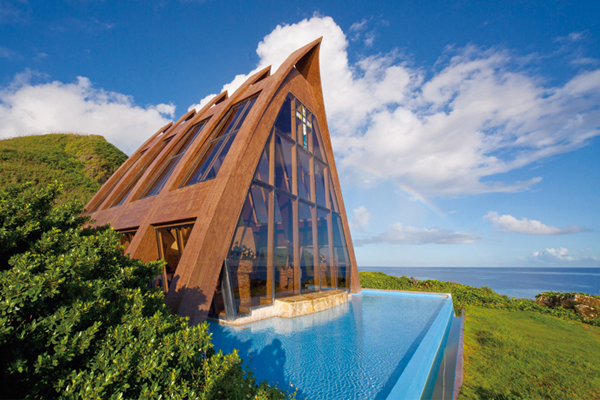 St. Probus Holy Chapel is the most recognizable chapel along Tumon Bay. It stands on an extensive hill by Hilton Guam Resort and is built with nature-inspired materials like stone, wood and glass visible from the famous Two Lovers Point. This warm space promises to inspire family bonds as well as lifelong memories for all attendants. 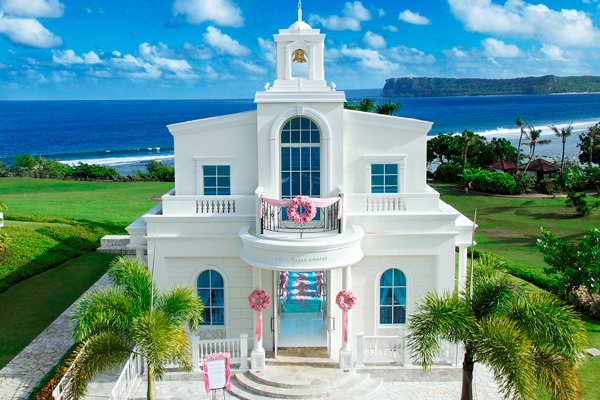 This chapel is operated by Watabe Wedding who recently opened a stylish and modern chapel called “Blue Aster” on Tumon Bay. The wedding lounge known as “Te Quiero” was the first wedding reception facility in Guam and is located next to Fiesta Resort on the beach. It attracts not only wedding planners, but business meetings are often held there. 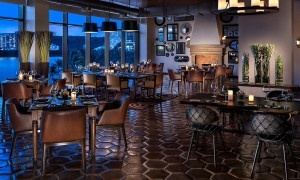 Many local people utilize this place as a small scale wedding banquet facility with fine dining cuisine. Watabe Wedding has 40 years of experience conducting resort-style weddings, starting in Hawaii and making inroads to the Guam market in 1995. They are the pioneers of the Guam wedding industry. Their complete hospitality creates the perfect atmosphere throughout the day making even your most stubborn aunty smile. 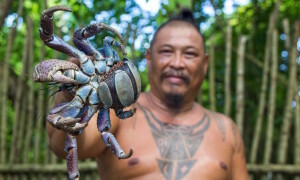 Their warm service makes clients feel welcome and gives them compelling reason to return to Guam. Guam has more chapels than we can mention. You are guaranteed a dream come true if you wed on Guam. You may be surprised what great variety such a small island offers for your special day. 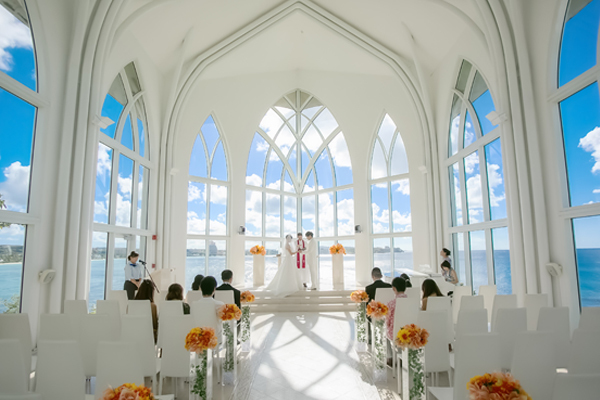 Sheraton Laguna Resort’s White Arrow Chapel, Hilton’s Aqua Stella Chapel, and Hyatt Regency Guam’s Jewelry by the Sea are all in five-star hotels for a storybook wedding, as indicated by the descriptive chapel names. No detail is left untouched for lifelong memories. The comment books of these resorts are full of appreciative couples who had fantastic wedding experiences. 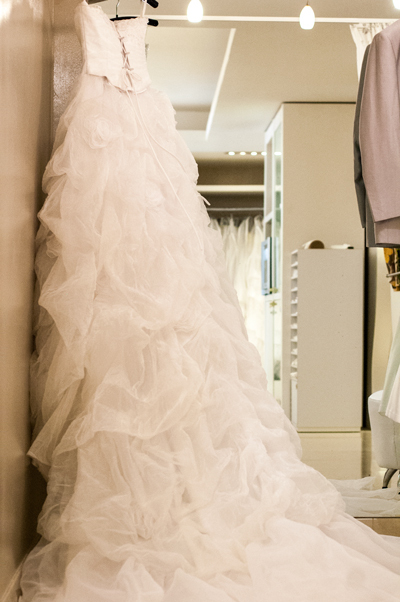 Located in Westin Resort, Couture Naoco is constantly updating its wedding dress stock to keep up with the latest trends. The Couture showroom is so packed with gauzy gowns, you can’t see the floor. It’s no surprise, as the head office is a dress company with more than 20 designers on staff. You will find sophisticated styles and a wide range of sizes to appeal to most any bride. According to the company, Couture dresses are preferred by 60% of Japanese brides. Couture Naoco has their own maintenance room just for the dresses, which are cared for immaculately. Even well-worn dresses, dragged from beach to chapel, are hand-washed with filtered water to keep each dress sparkling white for the next beaming bride. Because hairstyle and makeup should complement the dress, Couture invites top-of-the-line hair and makeup artists to train their staff to achieve the most advanced techniques and stay fresh with trends. All hair and makeup is completed in 90 minutes, which is 30 minutes longer than most. 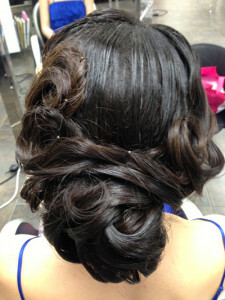 The goal is always to bring out the natural beauty in each of bride. Many brides bring magazines and style books to the salon to complete their look, inspired by a favorite model or celebrity, but some differences of opinion exist between stylists and their brides. For example, a very beautiful bride who needs little enhancing may want a classic hairstyle that the experts feel ages her and doesn’t fit her modern look. Or, the other way around — an older woman may enter the salon in hopes of being transformed into a much younger model. Do weddings make couples feel younger? Perhaps. Even older grooms sometimes cannot suppress their boyish humor, even in the chapel! Of course this is the biggest day of your life, so you can do whatever you like, but it’s wise to listen to the professionals to achieve a natural and true look. “Charisma” salons like Entre Nous in Tumon and Salon Paradis in Agana offer truly professional services and recommendations. They are well known for total beauty care and are the perfect option for a picture perfect wedding for a couple intent on getting the best portraits from their important day. Guam is a great venue for photos because we have an endlessly perfect background — from swaying coconut trees to saturated sunsets. It’s a dream destination for those who desire soft ocean breezes and sand in their toes. Many couples opt for a special shooting tour, which can be arranged by Satok. Their motto is, “Understand what the customer needs and maximize Guam’s beauty at a reasonable rate.” They provide a variety of wedding dresses, realistic bouquets, hair accessories, and jewelry, but you can bring your own items as well. Your creativity can be limitless. Established in 1922, Satok was the very first laboratory to make color prints in Japan. Their Guam location employs many local photographers, so clientele is not limited to off island visitors. According to Satok, morning light is perfect for wedding photography. Start the day with site seeing, at the same time capturing great photos at locations only experts know about. This company is a great option for a small, private, memorable wedding. 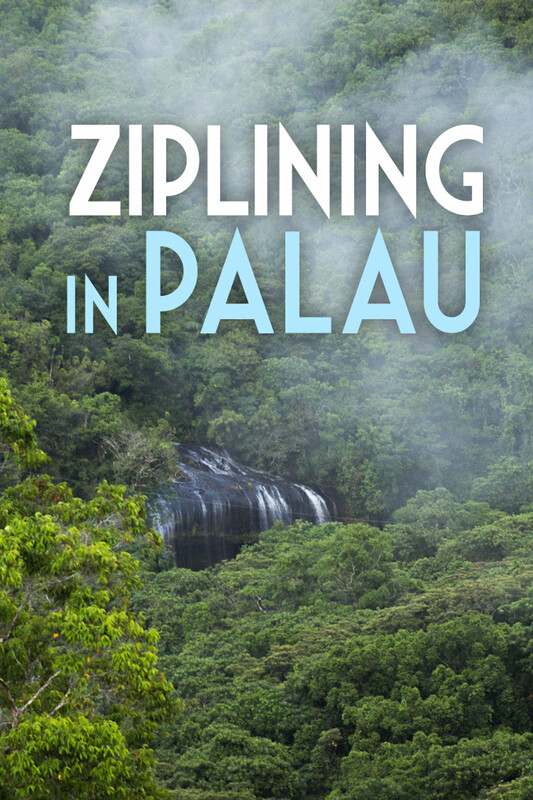 For legal requirements, see our article Getting Married in Paradise. Resort style is one of the most popular wedding types for nearly all age groups. If you are woman, you have no doubt dreamed about what your wedding day will be like — your loved one swearing everlasting vows on a beautiful beach with the clear blue ocean and white sand under your feet. Guam is the choice destination for a romantic and convenient wedding ceremony with a plethora of options. So, what are you waiting for? Start planning today! Photos courtesy of Satok, World Bridal, Arlius, and Watabe Wedding. A native of Japan, Ayaka arrived on Guam in 2000. Born in Osaka, and raised in Tokyo, Ayaka fell in love with Guam’s gorgeous beaches and island hospitalty. Working in the hotel and tourism industry full-time, Ayaka enjoys relating her love of the island as a weekend blogger. It is her goal to share valuable insider tips with every Japanese person interested in Guam.